Showing results for tags 'handguard'. I bought this a couple weeks ago, installed it, and removed it. It wasn't the look I was going for. Not sure if CSS has a return policy, but figured it wasn't fair to ask for a refund for something I installed. So I'd like to sell it so I can buy another item from them. Edit - Sorry, forgot about price. Asking $50 plus shipping to the US. Not sure what contributor status is. 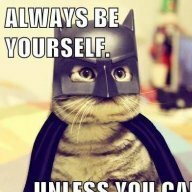 Tried to read rules but it kept taking me back to main page. Trying to find a Lower Retainer for my vepr, I have a RPK stock set I would like put on it. most places I find one are sold out. Thanks for any help. WASR with Zhukov furniture, Ultimak rail, Primary Arms Advanced Microdot, AKT trigger. 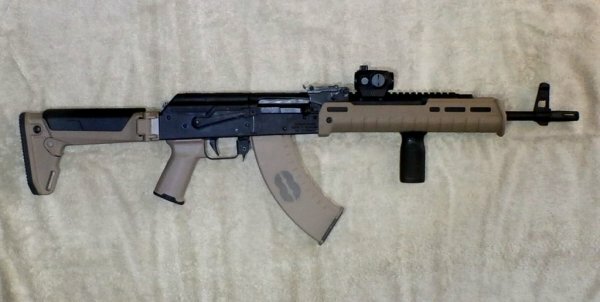 Dimensional differences between Saiga and VEPR shotguns? Are there significant dimensional differences? For instance, the difference between the front of the trunnion and the gas block/cylinder, lengths of the associated handguard sections, etc? I opine that most AK handguards do not fit, and that Saiga shotgun furniture does not interchange with VEPRs, and vice versa. I just purchased a Saiga 7.62x39. I plan on replacing the handguards with a wood set.My understanding is that I need to replace the gas tube with an ak-74 gas tube. I am having trouble finding an ak-74 gas tube anywhere online. This is the only one in stock I could find, is this what I need? http://aa-ok.com/gas-tube-for-ak74.html Thanks! Payments accepted through PayPal. Please send me a PM if you are interested: GRIP: MFT Engage Pistol Grip, Black. Excellent condition. $10 + $3 shipping. HANDGUARD: MFT Tekko Lower Handguard, Black. Some small scratches where it fits into the receiver, but excellent condition on the whole exterior. $15 + $3 shipping. Guntec USA rail. Drop-in replacement for AK handguard (rifle must have a handguard retainer installed). Includes multiple shims to fit different receiver shapes. Fair condition. I did some sloppy grinding on the front left side, but the rest of it is in like-new condition. $18 shipped. I accept PayPal. Please PM if interested. Want to buy factory issue saiga 12 handguard for airsoft use. I am located in Canada and have already bought 1 from another user on this site and fully researched import/ export legislation. Please reply with pictures/ price. Thanks in advance! AK Original Style Pistol Grip - Black. Used twice; very good to excellent condition. MSRP: $11.99 plus S&H SKU: STK06201BLACK My price: $10.00 SHIPPED SOLD AND SHIPPED to Bugger Saiga Original Factory Stock Black Synthetic Forearm Forend Handguard For .223 & 7.62 x 39 Rifle. Used twice; very good to excellent condition. My price: $15.00 SHIPPED Viking Tactics Rifle Sling VTAC-MK1-BK (Black) Lightly used; in original packaging, very good to excellent condition. MSRP: $34.95 plus S&H My price: $25.00 SHIPPED (or trade for Condor Speedy 2 point sling). SOLD AND SHIPPED to ChileRelleno -------------------------- Money orders (check with your bank if MO is free; Bank of America's MO are free to its customers). All items: tracking and insurance extra, if desired. Thanks for looking, Happy Shooting! WTS Ultimak & AK gas tubes+AK handguard. Used Ultimak gas tube/scout rail -$65 shipped SOLD AK gas tube and handguard set -$30 (sold as package, gas is used but in good condition, the handguard top is a bulgy surplus and the bottom is new off a sagia 5.45) PP gift, no shipping outside CONUS. I just received two of the small versions of the AR forearms to go onto a 7.62x39 and 5.45x39 and as always the service was outstanding. Anyways when I installed them on both weapons the clamp that goes around the barrels does not clamp down tightly over either barrel. The forearm is pretty stout and seems nice and sturdy but there is a small amount of play at the barrel clamp, I'm wondering if this is normal and the way they are designed. I just wanna make sure that I didn't get the wrong size by mistake. It seems that as long as the back of the forearm stays put and does not work it's way loose then the extra play at the front clamp will be actually beneficial since it will not interfere with the barrel expanding and contracting as it heats and cools. I'm really looking foreword to getting out and putting some rounds though these guns with the new AR forearm. If it preforms as I think it will it will really be a God sent as far as fairly lightweight and heat proof forearm that allows a much better forward hand position to mitigate recoil and swing the gun (competition style grip). I'm going to attempt to put a thorntail flashlight mount from haley strategic on it too so I'm let you guys if that works out as well. Hi I'm new to the fourm I just converted my saiga 7.62x39 to a pistol grip configuration and high cap mags. Now I am looking at doing the handguards. I already have a wood handguard set I just need the normal akm gas tube and a bolt on bottom handguard retainer. PLEASE let me know if you have either of these, thanks! 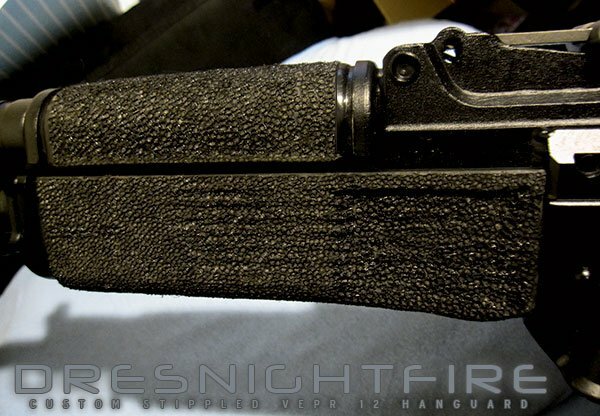 Looking for the full length vented galil-style handguard for a 19" Saiga 12. WTS: Saiga OEM Stock and Handguard in xlnt shape. Used once prior to conversion. Removed off .223 Saiga; believed to fit 5.45 mm. Stock: $20 shipped USPS 1st Class. 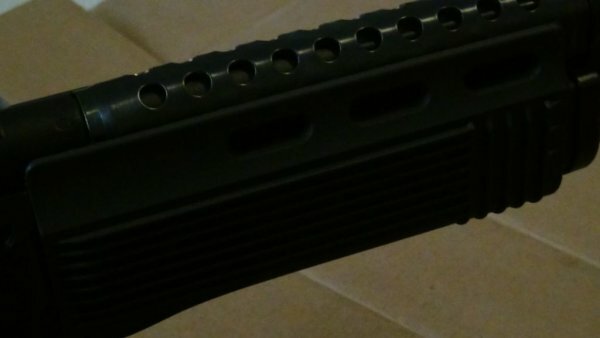 Handguard: $12 shipped USPS 1st Class. Get both for $30 shipped. Additional shipping options available at actual USPS/UPS/FedEx cost. Thanks for looking, Happy Shooting! +1 for Jay for superior workmanship and innovative idea on the hand guard. Excellent communications and written instructions. Great selection of designs. Very comfortable feel and unlimited accessories' mounting possibilities. Watch out for Fuglystick imitators: there is significant difference in structural design of gas block mount, when imitators' cheap approach can cause serious wear-based damage.